Janie Bress - My North Shore Blog: Shop Till You Drop This Weekend at the Winnetka-Northfield Sidewalk Sale! 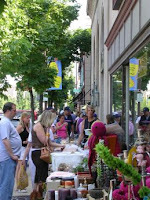 Shop Till You Drop This Weekend at the Winnetka-Northfield Sidewalk Sale! As a North Shore Real Estate agent, I enjoy not only bringing you the latest real estate news and home tips, but local news and events as well! My goal is to provide you with a well rounded view of life on Chicago’s North Shore and highlight what makes it such a great place to call home. If you are currently living in the North Shore, or are planning on visiting for the weekend, you’ll want to head over to Winnetka this weekend for one of the years most favored events! The Winnetka- Northfield Sidewalk Sale, taking place this Friday, July 15 and Saturday, July 16 from 9am-5pm, is a fun time for young and old alike and is a great way to interact with the community. For over 40 years, the Winnetka Chamber of Commerce has been hosting this free event, and is welcoming Northfield into this years’ event! Both villages will be featuring local goods such as clothes, jewelry, books and much more from stores that line their charming streets. These local retailers have special prices and unique offerings for this shop till you drop weekend! Live music, local food and even displays by charity organizations will enhance the shopping experience. Because of Winnetka and Northfield’s committment to children; the Sidewalk Sale will also feature a Kid-entrepreneur section. This gives children the opportunity to get creative as they’ll sell items such a duct-tape wallets, crafts and other home made goods. Children will enjoy having something creative to do and will get a feel for business and being involved in their community. This year will also kick off the first ever Go Green Winnetka-Northfield Fair which will take place on Saturday, July 16 from 10am-2pm in Hubbard Woods Park. In an effort to create awareness and bring about a more eco-friendly environment to our communities the Go-Green Fair will feature information about simple ways to go green as well as activities for children and adults! You’ll learn about biking, recycling, healthy foods, compost, reusable art and much more. View more information at the Go Green Winnetka-Northfield website. Whether you are a permanent resident of Winnekta or Northfield, or are in the North Shore area; I encourage you to take part in this fun event! Perhaps you’re considering a move to Winnetka or Chicago’s North Shore and want to get a feel for the community. This weekend would be a great opportunity to do so! You can also view more information on the Winnetka-Northfield Sidewalk Sale to see the specific retailers and other detailed information on the event. If you have questions about living in Winnetka or Chicago’s North Shore; let me know! I’d enjoy the opportunity to talk with you and answer your questions about buying a home in the North Shore. I hope to hear from you soon!